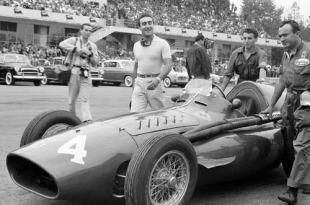 Juan Manuel Fangio, already confirmed as champion, won the final round of the severely-truncated season at the Italian Grand Prix. In what was to be its last Formula One race for decades, Mercedes signed off with another 1-2, although it was Piero Taruffi who followed Fangio over the line and not Stirling Moss. Monza had been extended to 6.2 miles by the inclusion of two high-speed banked sections while Lancia returned to the fray, now running under the Ferrari banner. More than 300,000 spectators lined the circuit and the race was started by the Italian president. Within a lap or two four Mercedes were out front, a situation that only altered when Karl Kling, in what was to be his final race, retired on the 33rd lap and soon after Moss was forced out.